Dil Maya Majhi (right) was 8 months pregnant when she contracted malaria. Nepal’s use of an SMS alert system led to the young mother receiving treatment and she gave birth to a healthy baby boy. Photo by Suresh Bhandari. In the fight against malaria, Nepal has accomplished what many other countries in the developing world can only aspire to—reducing by more than half the number of confirmed cases of the often fatal disease in just 6 years. The successful strategy that led to the precipitous drop in confirmed cases—from 3,000 in 2010 to less than 1,000 in 2016—has put this country of 28 million on a clear path to becoming malaria-free by 2026. However, if new indigenous cases of malaria or those imported from elsewhere are not diagnosed and treated quickly, if onward transmission of existing cases is not prevented and if areas with a concentration of malaria cases are not controlled and managed well, then the momentum toward malaria elimination could quickly be lost. That’s why Nepal’s elimination efforts are at a critical juncture. Since April 2016, the Maternal and Child Survival Program (MCSP), the United States Agency for International Development’s flagship program led by Jhpiego, has been working closely with Nepal’s Ministry of Health to build the technical and management capacity of its national malaria elimination program to carry out efforts through grants provided by the Global Fund to Fight AIDS, Tuberculosis and Malaria. Malaria is one of the world’s most serious public health problems, affecting 212 million people annually. Pregnant women and children are particularly vulnerable to the disease, which caused an estimated 429,000 deaths in 2015. One of the game changers that has helped quicken the pace of Nepal’s fight against malaria is the use of a mobile technology solution—using a simple mobile SMS to notify the district malaria team of any malaria case detected in the community. The information from the SMS is recorded automatically in a malaria disease information system, and experts from the district malaria team then follow up with a case-based investigation to understand and eliminate the factors that allowed transmission. One such SMS helped save the life of 34-year-old Dil Maya Majhi, who was 8 months pregnant when she contracted malaria. She lives in the village of Dhaadkhola in the community of Tulsi Chauraha, which had not reported a single case of malaria in 5 years and thus had a risk level of moderate. When the malaria disease information system received a couple of SMS messages from the area last summer, health officials mobilized to visit the community and investigate further. The team diagnosed 23 people with malaria, including Dil Maya Majhi. The others recovered with medication, but because Majhi was pregnant and therefore more vulnerable to the serious effects of malaria, the officials decided to hospitalize her. Thanks to timely detection and appropriate treatment, Majhi recovered completely and went on to deliver a healthy baby boy. Had it not been for the SMS system of recording cases in the information system, there might have been a full-blown outbreak in the community, jeopardizing the lives of many, including Majhi and her unborn baby. Just as prompt identification of malaria cases is vital to preventing an outbreak, accurate diagnosis and correct and timely treatment are essential to controlling the spread of the disease. Diagnosing the specific strains of malaria can be challenging because the conventional diagnostic method of using blood smear microscopy lacks sensitivity and specificity in many malaria-endemic settings. MCSP worked with the Nepal government and partner Save the Children to set up centers to conduct advanced tests for malaria diagnosis using the more cost-effective option of collecting dried blood spots on filter paper, rather than whole blood. This method is useful in low-resource settings because material can be easily collected in rural areas, stored at room temperature and transmitted to one of the centers for testing. So far, MCSP has assisted the government in setting up two such centers in the country. “The Global Fund appreciates (the) critical support provided through President’s Malaria Initiative/MCSP as technical assistance within the division of Epidemiology and Disease Control to help define an elimination framework and implement cutting edge and innovative solutions to eliminate malaria in the specific context of Nepal,” said Nicole Delaney, Fund Portfolio Manager of the Global Fund for Nepal. 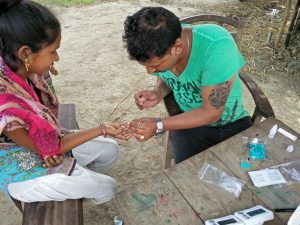 Malaria testing in a village in Nepal. The country is working to eliminate malaria by 2026. While taking giant strides in strengthening Nepal’s malaria readiness and response program, MCSP has put in equal effort to ensure a seamless supply chain for antimalarial medication. Inventory management and up-to-date stock records are critical for making malaria commodities available at peripheral health centers, and a functioning information system helps track supplies of malaria medication. Appropriate use of this system ensures that the right drugs are available at the right place, at the right time and in the right quantities. With MCSP’s technical assistance, an online reporting system has been established that provides real-time reports of drug stocks from the district level to the central drug store. This enables timely distribution of drugs as per the needs of the districts, preventing stock-outs of antimalarial drugs at service delivery points. From November 2015 to March 2017 Nepal made tremendous progress in its fight against malaria. The number of insecticide-treated bed nets distributed to targeted pregnant women increased six-fold, from 3,714 to 18,323. The proportion of suspected malaria cases observed in public health facilities that were tested rose from 56% to 100%, and the proportion of suspected cases in the community that were tested went up from 0 to 62%. All confirmed malaria cases received first-line antimalarial treatment as per the national protocol at service delivery points. The proportion of confirmed cases of malaria that were fully investigated increased from 22% to 52%. Data reporting also improved, with 73% of districts submitting timely malaria data reports per national guidelines, an increase from 52% in November 2015. The next few years are critical for Nepal. The country needs to succeed in the 5-year elimination phase (2017–2022) and ensure that there are no cases for 3 years thereafter. But with a determined country working diligently toward this goal, the chances have never been better for Nepal to reach the finish line and become malaria-free! Emmanuel Le Perru is the Sr. Technical Advisor, Malaria Program / Global Fund Liaison, MCSP, Nepal, and Prakash Raj Pant is Malaria Supply Chain Advisor, MCSP, Nepal. Health Management Information System (HMIS) and Global Fund Malaria Grant Performance Report.